I've finished episode 5 which is set a couple of months after the conclusion of episode 4. The game now tells the story of the New Order of the Stone. You basically end up going on an adventure searching for some mysterious artefact that Ivor keeps fantasising about called “the Eversource”. The antagonist in this episode happens to be one of the ex-Ocelot members called Aiden and it's up to you to stop him. The episode was quite glitchy and it's the first time I've played a Telltale adventure where the notifications informing you whether a character remembered your actions are blank. It's not a terribly big issue but it would be nice to know. Also, labels that pop-up are getting scrambled too (e.g. one time I had a “Talk to Lukas” popping up for multiple characters – and no, they weren't all called “Lukas”). Lip synching issues seemed to resurface towards the end of the episode too. Ultimately, it was a pretty good episode since it had an interesting ethical conundrum which makes it more in line with previous Telltale titles, but man are some of these characters dim-witted. I did it! I finally finished Company of Heroes 2! The final mission is, as you've probably guessed, the Soviet's final push into Berlin to capture the Reichstag. The mission ultimately took 1.5 hours to complete so it was a bit of a slog but it was doable. I used a huge force of veteran conscripts which captured any weapons they found lying around (e.g. MG42s, Panzerschrecks, even German tanks). These guys were supported by an IS-2 Stalin Tank, an ISU-152, two elite mortar squads and some engineers; they were a sight to behold. I gradually took over the city but had no air or artillery support at the start; the end of the mission was a different story as you unlock the ability to use IL-2 bombing runs as well as incendiary artillery strikes – perfect for decimating German defences. In terms of the actual storyline, there's a twist at the end which is good to see but it also makes me question why the game was slammed so hard as being Anti-Russian by several Russian commentators. I can see it as being Anti-Soviet perhaps but it doesn't devalue what many soldiers did during the war, at least not from my perspective. Still, if you hated films like Enemy at the Gates, you'd probably end up hating the single player campaign in Company of Heroes 2 as well. 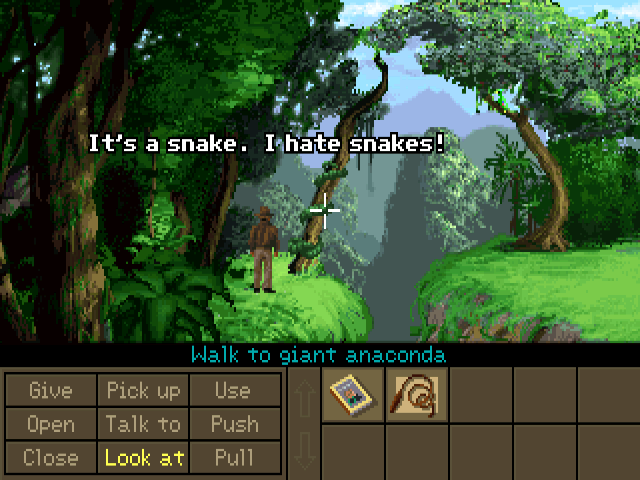 So, since I've finished Company of Heroes 2, I've now moved onto the next of Luke's suggestions which happens to be a classic 90s Lucasarts adventure: Indiana Jones and the Fate of Atlantis. Despite playing several point ‘n' click adventure games in my youth, you might find it as a surprise that I've never actually played Indiana Jones and the Fate of Atlantis, so it'll be interesting to see how I view this game considering it's now 25 years old! So far, I'm enjoying it although after playing both the GOG version and Steam version I must say the GOG version is superior. I'm not sure which emulator the Steam version uses (maybe DOSBOX?) but the MIDI synthesiser seems worse than the GOG version and the anti-aliasing effect on the Steam version isn't that attractive or authentic.